After a long and tiring day, nothing can replace the simple joys of being able to relax at home. Spend those evenings in this ultra-soft and comfortably plush robe. Slip into this soft, superbly comfortable robe at the end of your day and instantly feel the soft touch of the fabric caressing your skin. The super soft polyester instantly puts you in the mood to unwind after that tiring day. Go ahead and grab a glass of wine while you lounge on the couch and catch up on your favorite Netflix series. This robe will surely take all of your worries away. 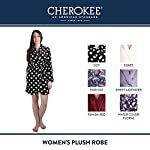 Cherokee Plush Robes are crafted to give you the highest level of satisfaction at a price that you’ll love. Each garment passes through a strict quality assurance process to ensure that every inch of stitching doesn’t cause any discomfort. 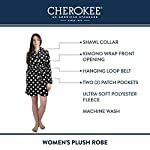 The garment’s texture is also examined to make sure that the velvety soft fabric is consistent all throughout the robe. 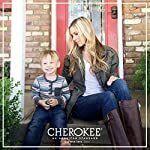 Gift yourself with this Cherokee Push Robes and savor the softness and the coziness that this will provide. We are certain that you will instantly fall in love with this Plush Robes once it touches your skin. Lint-free fabric ensures oft touch on your skin without any discomfort. Choice of colors matches your evening mood any day of the week. Carefully cut to perfect size to ensure a comfortable fit. 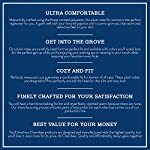 High-quality material guarantees value for your money. Pamper yourself at the end of every day. Go ahead and Click ‘Add to Cart’ now!